Chad Nagata is a junior at UH Maui College majoring in Electronics and Computer Engineering Technology. He plans to enter the new bachelor’s degree program in Engineering Technology in Fall 2011. 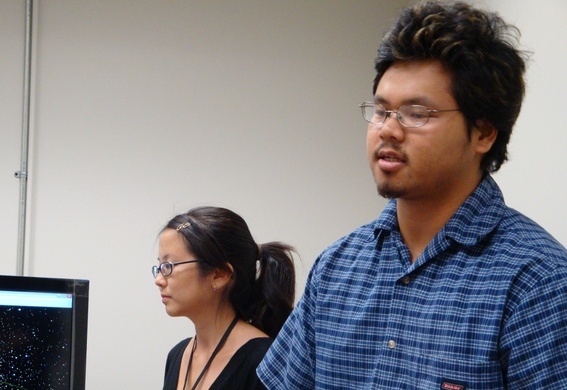 He hopes to continue working for Pacific Defense Solutions on the project begun during his Akamai internship. Chad enjoys being outdoors and doing all types of sports, including tennis, basketball, volleyball, and bowling. Galaxy 15, a television communications satellite, lost contact with its owner Intelsat in early April 2010. A malfunction believed to be prompted by a solar flare knocked the satellite out of its geostationary orbit, sending it on a drifting path in space. Now observations of this object are necessary to understand the threat that it poses to other operational satellites. We will be using two similarly configured optical systems to track and image Galaxy 15 for photometric and positional measurements. Each system is equipped with a 1024´1024 back-illuminated charge-coupled device (CCD), a focal reducer, and an eight-position filter wheel with Johnson BVRI and clear filters. One optical system is on Maui, and the other is in Albuquerque, NM. Both systems are capable of tracking Galaxy 15 autonomously through a network-tasking GUI. Calibrated satellite data will be automatically collected from these two systems and processed using software called Astrograph, which provides accurate positional and photometric information on the object. This data will help analysts understand how the uncontrolled drift of the Galaxy 15 satellite will affect other operational satellites.